Samsonite Lite Cube DLX Spinner Review - Is It Worth It? Samsonite has always been a manufacturer of quality luggage, and the Lite Cube is no different. It is a luxurious, high quality piece of luggage, so naturally, it is on the expensive side. However, Samsonite luggage is usually able to justify the high price tags with quality and durability, and we are here to put the Lite Cube to test and see if it holds up. Frequent flyers know how important it is to have a sturdy, lightweight suitcase, and are therefore willing to spend a bit more. In this review, we will take a detailed look at the Samsonite Lite Cube Spinner and its most important features. If you want to find out whether its high price tag is justified, then read the rest of the review! 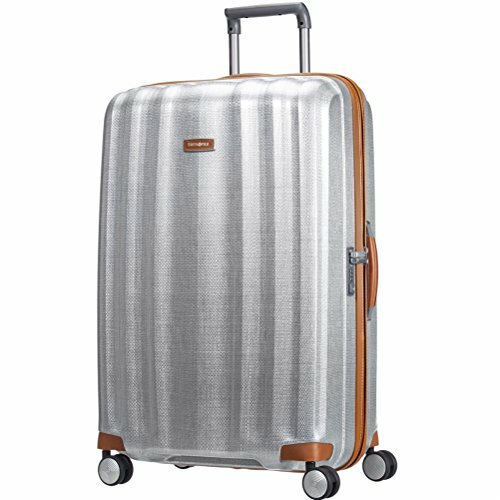 The Samsonite Lite Cube Spinner: Is There Enough Value For Money? 30.2" x 21.4" x 13.5"
The Samsonite Lite Cube is a hardshell suitcase, and it is made with revolutionary Curv technology. This material is an incredibly lightweight one, which is obvious from the weight of the suitcase; the 30” version weight only 7.9 lbs, which really is impressive. The material is also very lightweight and durable, and performs particularly well at low temperatures. Also in terms of materials, this suitcase has leather details on the zipper, and the handles. These details really make the suitcase look more elegant and luxurious. The zippered closure is really the only thing that I don’t like about the suitcase; I prefer latch closure on hardshell suitcases, as zippered suitcases can easily be broken into. In addition to that, the Lite Cube comes with 10-year worldwide warranty, so if anything breaks down accidently, Samsonite will fix it right up. As for the dimensions of the suitcase, Samsonite makes it in several different sizes, but most of them are sold out. Therefore, I will focus on the 30” version of the Lite Cube, and its dimensions are 30.2" x 21.4" x 13.5". This is a very large suitcase, and with a volume of 96L, you could comfortably pack enough clothes for at least a couple weeks. Fortunately for you, the Lite Cube is equipped with double spinner wheels. These wheels turn 360 degrees each, making the steering of this suitcase a piece of cake. If you haven’t previously owned a spinner suitcase, then be prepared for a pleasant surprise! These wheels roll like a dream, and I promise you will never want to spend your money a piece of luggage without them. They allow you to pull your suitcase without having to tilt it, but also to push it in front of you or alongside you. Because you don’t have to tilt your suitcase, your arms will be less strained, which is particularly beneficial if you are a really tall person. With the Samsonite Lite Cube Spinner, strained arms and back will be a thing of the past. The interior of the suitcase is lined with poly jacquard fabric. There are 2 compartments, which are both equipped with the flex-divider system. The dividers look really sturdy, and they guarantee that the contents of your suitcase will not budge an inch in transit. Well, unless you accidently packed your cat, but that is a completely different problem. In terms of the carry handles, there is one on the top of the suitcase, and one on its side. They are incredibly soft to touch and are made from leather, so they are really sturdy. They will not let you down even when your suitcase is packed to the brim. 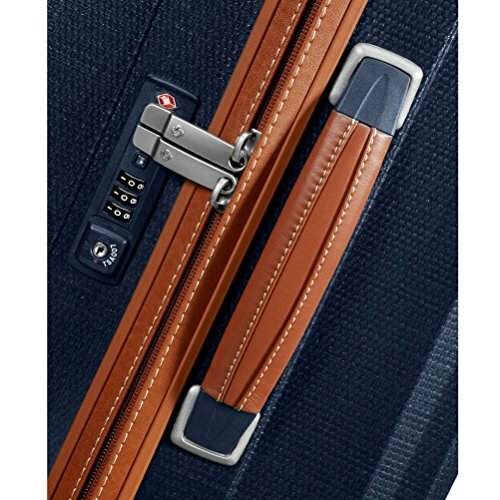 Samsonite Lite Cube is equipped with a TSA Approved combination lock. You can choose the combination yourself, and it only takes a couple minutes to set up. Once you lock the zipper pullers, no one will be able to open up your suitcase apart from yourself and a few TSA agents. This is particularly important if you fly to the United States frequently. From time to time, TSA agents might choose your luggage for random inspection. With a TSA approved lock, they can access your belongings safely, without damaging the luggage. On the other hand, if the suitcase does not have a TSA friendly lock, the agents will have to open it up forcefully, which might damage it beyond repair. Therefore, you should always look for TSA friendly luggage, and the Lite Cube is just that. The interior of the Lite Cube is really where Samsonite decided to step up their game. The suitcase opens up into 2 fully lined packing compartments, both of which can be closed with a zipper. This not only makes the suitcase look beautiful and clean when opened up, but also ensures that none of your belongings will budge an inch in transport. In the middle of the suitcase, there is also a detachable packing frame with a hanger that can also be used as a divider pad. The bottom compartment is equipped with a large hinge pocket, as well as lowered cross ribbons that have a soft touch closing buckle. As for the top compartment, there is another zipper-closed pouch inside it. I would say that yes, there definitely is enough value for money. This is the most lightweight suitcase I’ve had the opportunity of assessing, especially for its size. This is a very big benefit of the Lite Cube, as every pound counts when it comes to baggage claim fees, and especially when talking about large suitcases. There are a lot of incredibly useful features on the Lite Cube, such as the TSA friendly lock, double spinner wheels, soft touch handles and fully zippered packing compartments. You’ll also love the shoe and laundry pouches Samsonite included, as well as the many little pockets on the inside. And it doesn’t end there. This suitcase is not only incredibly practical, but it just looks luxurious, with the leather details. It will definitely make you stand out in the airport crowds. On the other hand, if you are not really impressed with the Lite Cube, check out my review of the Rimowa Topas - maybe it would be a better fit for you. Therefore, if you want to travel in style head on over to Amazon and get a great deal on this amazing piece of luggage!